Nanotechnology is a field which is growing more rapidly than any other field of research at the moment. Knowledge of what nanotechnology is and how it affects us is good for everyone to know. This website includes a broad look at how nanotechnology is affecting our everyday lives with a slightly more in-depth look at how nanotechnology is affecting medicine and nanopharmaceuticals. There are aspects of nanotechnology which are of interest to everyone's tastes, from technology and cars to art and science, so it is worth having a read through this website, you'd never know what you might stumble upon! 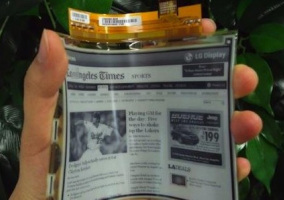 LG has announced that this six-inch XGA resolution Electronic Paper Display (EPD) is now in full production, and should be in devices bound for Europe within the next month(May 2012). Top Down, Bottom up, Size Matters! 'Atoms on a small scale behave like nothing on a large scale, for they satisfy the laws of quantum mechanics. So, as we go down and fiddle around with the atoms down there, we are working with different laws, and we can expect to do different things. We can manufacture in different ways. We can use, not just circuits, but some system involving the quantized energy levels, or the interactions of quantized spins, etc.' -Richard Feynman said this in his talk called 'There's Plenty of Room at the Bottom' on December 29th 1959. This idea of playing with atoms and molecules has been around for centuries but only in the last number of years have scientists been able to visualize atoms clearly and move them. Being able to move atoms and molecules has resulted in an explosion into the relatively new scientific world of nanotechnology. Word of the promise of nanotechnology is spreading rapidly, and the air is thick with news of nanotech breakthroughs. Governments and businesses are investing billions of dollars in nanotechnology R&D, and political alliances and battle lines are starting to form. 'Star Trek', 'The Hulk', 'The Tuxedo', 'Metal Gear Solid' and the bestselling book 'The Prey' 'all have mentions of nanotechnology which reflects the rise of public awareness. There are hundrerds of commerically available products using nanotechnology currently on the market including cosmetics, sunscreens, paints and coatings, catalysts and lubricants, water treatments, security printing, textiles and sports items, medical and health cares, food and food packaging, plant production products, verterinary medicines, electronics, fuel cells, batteries and additives, paper manufacturing and weapons and explosives. The word itself is a combination of nano, from the Greek “nanos” (or Latin “nanus”), meaning “Dwarf”, and the word "technology." Nanometer refers to the 10-9 power of a meter. For comparison, a human hair and a sheet of paper are about 100,000 nanometers thick. A mans beard hair grows 5nm per second. One nanometer is to a tennis ball what a tennis ball is to the earth. Nanoscience and nanotechnology involve the ability to see and to control individual atoms and molecules. Everything on Earth is made up of atoms—the food we eat, the clothes we wear, the buildings and houses we live in, and our own bodies, so nanotechnology affects almost every aspect of our lives today. Properties not seen on a macroscopic scale now become important- such as quantum mechanical and thermodynamic properties (when the size of materials is reduced to less than 100nm the realm of quantum physics takes over). For instance, materials can be stronger, lighter and highly soluble, less hygroscopic, or with totally different physicochemical properties. Opaque substances become transparent (copper); stable materials turn combustible (aluminum); insoluble materials become soluble (gold). By learning about an individual molecule’s properties, we can put them together in very well-defined ways to produce new materials with new and amazing characteristics. Mother Nature arranged these materials accordingly but now we can engineer materials using nanotechnology, to create entirely new materials, devices and structures. To be able to manipulate molecules and atoms they first needed to be visualised. Nanotechnology kicked off with the invention of the scanning tunneling microscope. You can't talk about nanotechnology without mentioning the microscopes involved. Click here to read about them. On that historical note, the timeline of the major events leading to where we are today with nanotechnology can be seen in the drop down menu above, conveniently named 'Timeline'. -Nanoparticles: A particle having one or more dimensions of the order of 100nm or less. -Buckyballs (Buckminster Fullerene): A buckyball looks like a nanometer-sized soccer ball made from 60 carbon atoms. The Future is but a Nanodistance Away! So with all that serious stuff out of the way let's now look at the real reasons why we should be interested in nanotechnology. Not only is it saving lives by diagnosing and curing cancer more efficiently but it is also involved in improving the earth by pollution reduction and energy renewal, curing other potentially fatal diseases, improving transport and communications and making our lives more comfortable overall. This website intends to portray the aspects of nanotechnology which have the most impact on us and which will be of biggest interest.